Funny, funny, funny!!! The tales of a second-grader who's afraid of everything. Guaranteed to make you hold your sides--because, if you don't, you'll split them laughing! Walking war machines vs fabricated animals in an alternative history of World War I. Lots of adventure, action and things that blow up.Great reads! Most of you probably know about these books, but if not---go get one right away!! They pull you in and won't let go! One of the great guy books of all time that asks the question, "Could you eat 15 worms in 15 days?" Mystery, fun, and excitement as Steve Brixton (he has no brother--he just thinks it sounds cool) unravels criminal plots. Besides, where will you find out that all librarians know 9 forms of martial arts? All right, guys, go out there and have a great weekend. And be sure to tell us what you read (or listened to, if you love audiobooks) when you get back! Hey and how-de-do to all you fans of reading! 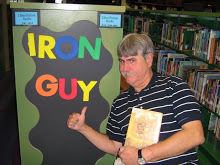 The Iron Guy has been extremely busy lately. Life at the library gears up for summer and, after the big season hit, I went into hyperdrive.You've probably noticed that I haven't posted any of my own reviews for a while and that's because I've been so busy--which is good because that means so many kids are out there reading! (And I really appreciate reader guys like Michael and Sammer and mphuff who have taken up the slack) But, no matter how busy things getI always make time for a Rick Riordan book. I'm a HUGE fan of his stuff and was very excited when The Serpent's Shadow, the third and final volume of The Kane Chronicles series, fell into my eager hands. I finished it during the summer and enjoyed it. A lot of you have probably already read it, but some of you haven't. If you haven't, then pay attention. If you have, write and tell us how YOU liked it. In case you don't know what these books are about, here's the lowdown--Carter and Sadie Kane are the son and daughter of a famous Egyptologist, who just also happens to be a powerful magician. Through a series of adventures too complicated to relate briefly, Carter and Sadie find themselves as the only two humans to stop Apophhis, the giant Chaos Serpent from rising from his ancient prison and swallow the sun. In this book, they finally discover a way to banish Apophis, but it's a tremendous risky task--they must find his shadow and cast an execration spell right to his face! This book has all the Rick Riordan trademarks that we guys love so much--the action, the humor, and the vivid and believable otherworldly settings. This story moves right along, keeps your attention, and makes you laugh often along the way. I enjoyed it but, to tell the complete truth, I didn't feel the incredible suspense that I found in all the other Rick Riordan books. This is not a criticism because I enjoyed this book very much; it's just that I knew somehow that the characters would come out all right, even when the had to go face-to-face with Apophis. Maybe it's because I've read so many RR books that I just knew Carter and Sadie would make it.I didn't get that feeling in, for instance, The Last Olympian. There you really felt that Kronos might actually destroy the world and Percy along with it.But don't let me stop you from reading this book--like all of Rick Riordan's books, this is a good read. Maybe some of you have read it and disagree with me. If so, write in and tell me!